So I’d thought I’d give Google’s Friend Connect a whirl. Friend Connect allows you to embed social networking components onto your website. Out of the box you get a members gadget, a wall gadget and a review/rate gadget. Since it is all based on OpenSocial you can add any other OpenSocial gadgets to your site as well. It took all of 5 minutes to set up the members gadget as the “Friends” box in the left bar of my blog. 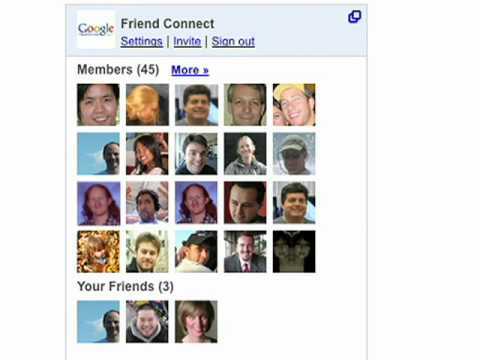 Google Friend connect is a direct competitor for Facebook Connect which lets you do similar functions but built around the Facebook API. Facebook Connect is much harder to set up but seems to be gaining more traction with big sites such as Digg. It’ll be interesting to see who wins this race and if this whole thing takes off.